Used this last night in a talk and thought I would share it. It’s an adaptation/sometimes-direct-quote of Keith Johnson’s great illustration found in the article Hearing the Music of the Gospel (which I highly recommend reading in its entirety). 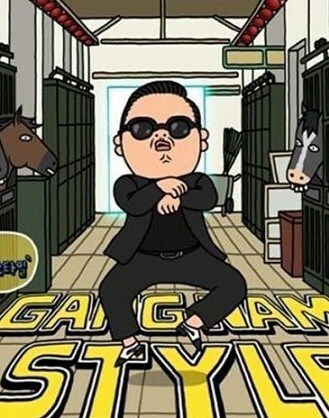 Disclaimor: the Gangnam Style variation I used probably has a shelf life of 1 month before it goes the way of the Macarena. But the illustration obviously works without the current fad song. Imagine you’re in the library (I know for some of you Business majors that is difficult to imagine). You’ve got your required study equipment on – headphones. You’re studying. You’re riding a pony. You’re lassoing. 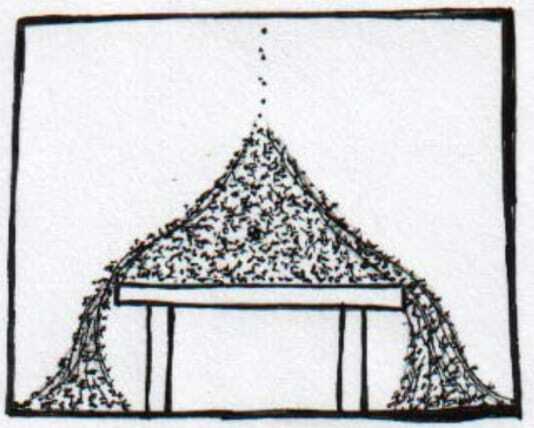 You’re shuffling your feet under the table. You’re “studying”. Needless to say- You’re having a good time. Imagine (and this is very possible) a time traveler from 1960 comes up to your table. He sees the smile on your face. He sees you riding a pony. Lassoing. He has no idea what Beats by Dre are. He thinks: That looks like fun. I think I’ll try that. So he sits down next to you and begins to imitate you. Awkwardly at first, he tries to get down your complex, finely tuned dance moves. With a little practice, he begins to catch onto it. He’s mirroring your actions pretty closely. But although he eventually gets better at keeping time, he concludes that it’s not as much fun or as easy as it initially seemed (especially riding the pony—very difficult to do when you’re not actually hearing the music). After a while, a third person enters the room and watches this scene. What does he see? Two people apparently doing the same thing, apparently listening to the same thing. Is there a difference? Absolutely. The first guy hears the music and his actions are a natural response to the beauty of the music’s rhythm and melody. The second guy is merely imitating the outward actions. He’s not listening to anything. Though we come to know Christ through grace, we are often like the second dude who tries to perform the dance without hearing the music. Our spiritual life is reduced to a series of dance steps— external behaviors and activities—devoid of God’s animating and transforming power. God’s desire is not to get us to do the dance but to get us to hear the music of the gospel, with the dance (godly actions, character, and activities) flowing naturally from it. But that’s looking for dance steps. 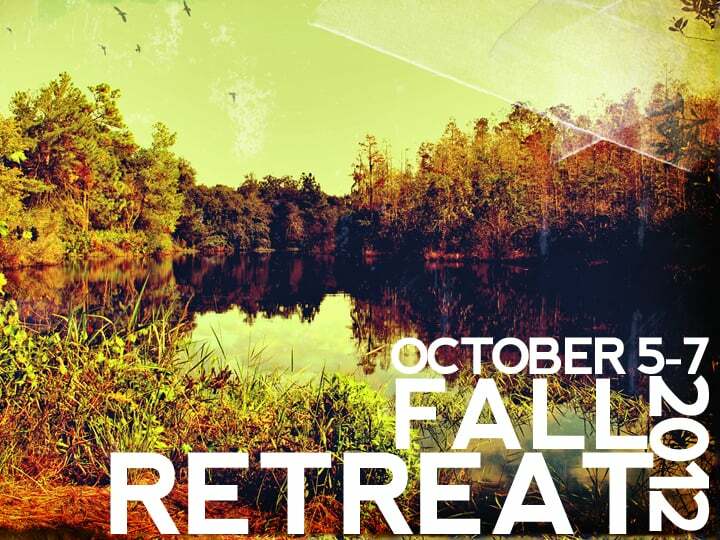 Our staff focus for the week is mobilizing our student leaders to recruit people to Fall Retreat. One of our goals this year is to improve in coaching our students to get better at challenging other students. And reading these paragraphs with the students we disciple is a step in the right direction. A challenge, therefore, goes beyond invitation. It contains a compelling vision of why this course is the right one, why passivity or neutrality on the issue is unacceptable, and compels a commitment. Does going to a conference make someone a better Christian, or not going mean they are not walking with God? Obviously not, but it is one of the few places on the planet where one experiences true biblical community and where community is created. Community to a Christian is as water to a plant: it is that important. Therefore sewing your disciple into a community of committed Christians is perhaps the greatest way you will ever serve them. A challenge is the way this service is executed, because until you’ve been to a conference it will always sound like the waste of a perfectly good weekend. Your spiritual child needs to eat green beans and simply offering them on the menu is not going to get the job done. A challenge to a conference focuses on two things: the benefits of going and addressing the obstacles to not being able to come. First, go through the many benefits of being at the conference using God-inspired overstatement where possible: “It’s like putting your spiritual life on steroids.” Next, ask the question: “What would be some of the potential barriers for you attending this conference?” Write them down as they speak and address each one. If it’s money, offer a scholarship; if it’s an upcoming test, go with them to the dumpster and help them rummage for the discarded answer key. (It’s just a joke). We need to build better bridges to life and ministry after graduation. We often say that your 4 years in Cru are really about the 50 years that follow. But in some ways our structure hasn’t helped prepare you for life and ministry after graduation. One reason is that some of our ministry methods don’t transfer easily to the work-a-day world. More tragically though, we have heard from far too many of our grads that the sudden transition from the considerable support structures they experienced in Cru to the independence and relative isolation of the “real world” has been jarring. Indeed, too many of our grads cease influencing others for Christ, and worse still others stop walking with Christ at all. 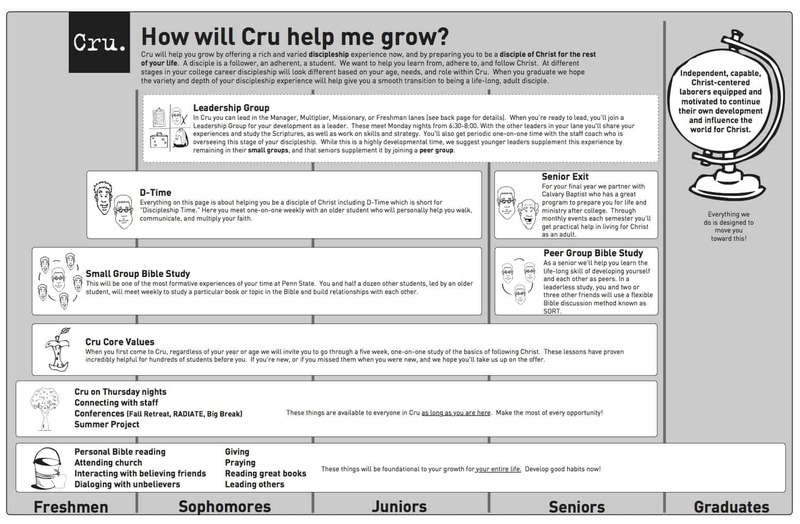 Typically, students in Cru get increasing attention over time culminating in the greatest attention their senior year. Then the day after graduation, it all suddenly goes away. A friend of mine who works with graduate students observed to me that in graduate school, where the plan from day one is to create independent adults, they increase independence over time, not attention. In this way the newest, youngest grad students get the most attention to lay their foundation, and the oldest grad students function independently. The day before graduation is little different from the day after graduation since they have been steadily moving towards greater independence. It seems that we have something to learn from this system. What strategies are you employing on your campus to help launch independent, Christ-centered laborers? Share the wealth in the comments. Think about a table you are pouring sand onto. At some point the sand won’t pile any higher and it will start spilling off the edge. The only solution is to enlarge the table. In our case the sand represents the students in the movement and the table represents our leadership. We will never have enough staff to form a table of the size that we need. Instead we need to free up and empower more students to be the table, while the staff function as the legs of the table. We will be here to support you, but it’s your movement; you are the leaders. While we hope that the staff have been and will continue to be a significant advantage to you, in some ways our structure has limited your ability to own and lead. Great vision to use with your students as you enter the fall.